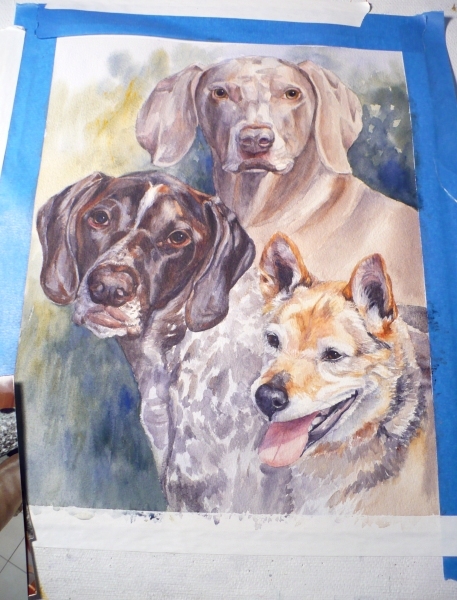 If you've been following along with this portrait, you may remember that only the faces have been painted so far and I've left the Weimaraner for last. This is Vaeda, a sweet dog with lovely eyes. In the photo I'm using, she is squinting in the sunlight, so I've widened her eyes so we can see them. I've blocked in some shadows and, after doing so, have noticed that she will not stand out against the pale background. So I add deeper color around her making a few more suggestions of trees in the background. I've deepened the background in other areas as well. I'll leave some pale background near the Pointer as his head is dark. The bodies of the dogs still need to be painted and Vaeda's eyes - can't forget those! 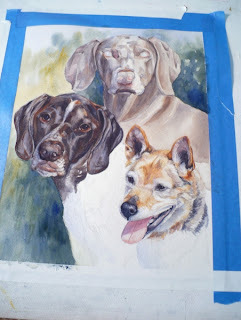 I've painted in everything and am happy with the dogs' faces, but there are still a few more adjustments to make before the portrait is finished. Gunner's spotted coat is lovely, but it draws attention away from Sam's face. Sam is the shepherd mix in the lower right. Even though Gunner's coat is spotted white and gray, I know I don't need to really leave it bright white in order for it to appear white. 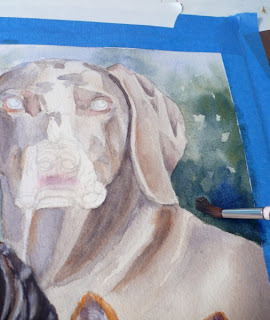 If I wash over the entire coat with pale blue darkening the areas around Sam's face, that should help make Sam stand out. After all, it's the faces that are important. Gunner's body can act as a background for Sam. Now that's better - Sam is not lost! The piece is finished just in time before the client stopped by my studio to pick it up. I'm happy because she said she is so excited to give this as a Christmas gift to her husband. She said the painting looks just like their dogs. It always makes my day when a client is pleased with my work! Don't Vaeda, Gunner and Sam make a stunning trio in a portrait? 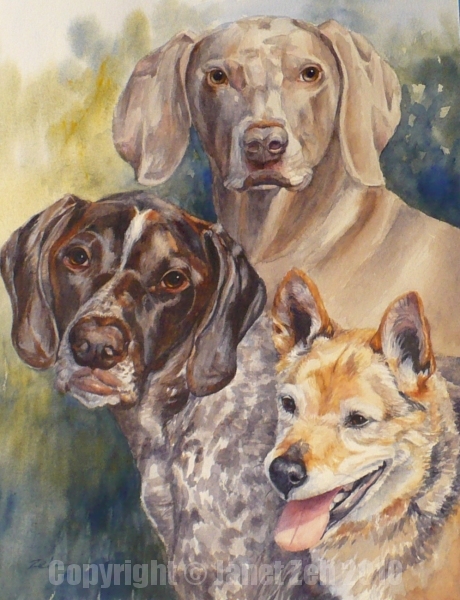 Do you have precious pets you'd like painted? Check out the details here, ZehPetPortraits.com or contact me. I'm so very glad that the painting means so much to you. It makes all the hard work totally worth it! 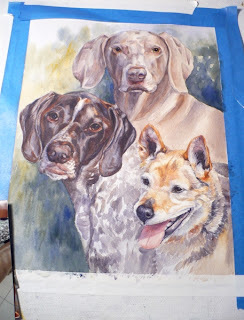 It was just delightful to paint Vaeda, Gunner and Sam. Great artwork. I am also in the process of doing my first one. I also use my dog as subject. I use oil based, How about you?